Cubital tunnel syndrome normally starts as an annoying numbness that may recur occasionally, but as time goes on this numbness becomes more frequent and severe. You may also start to feel pain, a burning sensation, and tingling. You can see swelling in the inner elbow area, and it may become increasingly difficult to move your arm or hand normally. You an also notice weakness in your fingers, and you may start dropping items if you have cubital tunnel syndrome. Treatment for cubital tunnel syndrome will depend on the cause and severity of your condition. In the early stages ulnar nerve neuritis may be treated with simple steps. Anti-inflammatory medications can help minimize swelling and inflammation, an can usually help with pain relief as well. Rest may also be advised, so that your tissues can heal. If certain activities are causing the problem your doctor may tell you to avoid these activities for a specific time. If the usual treatment methods do not resolve your cubital tunnel syndrome then you may need to take further steps. 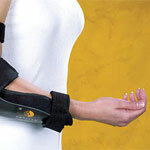 A splint or pad may be used to relieve pressure and make you more comfortable. Stronger pain medications and anti-inflammatory drugs may be prescribed. Ice and heat may help relieve any aching or pain as well as minimizing swelling. Physical therapy may be ordered as well, to help you stretch and work out the area. In some cases a pinched nerve or other complications may require surgery to correct the problem.